Environmental contamination is one of the serious issues to an environment and human health due to the contamination of a wide range of organic chemicals, industrial dyes and other hazardous substances in the drinking water, air and land. The innovation of the photocatalytic process has been presented to be the green and feasible method for the environmental decontamination. Photocatalysis has a wide range of application such as wastewater treatment (organic dye degradation), disinfection, solar water splitting, CO2 reduction and air purification. Many photocatalysts have been developed for the disintegration of water into CO2, H2O and other non-harmful substances. Compounds, with the help of O2, act as clean oxidants. Among various photocatalytic materials, the polymeric semiconducting photocatalysts show highly efficient photocatalytic performance for various photocatalytic applications. For example, oxygenated groups present on the surface of graphene oxide (GO) make it effective in the removal of pollutants such as phenol, chlorophenol and industrial dyes. 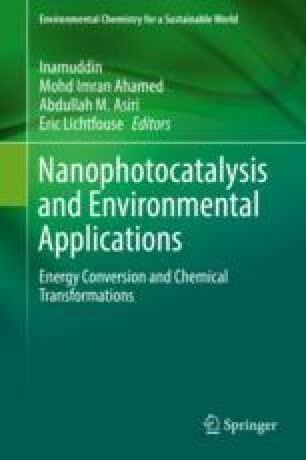 In this chapter, we discussed various chemical methodologies, properties and photocatalytic applications of polymeric semiconductors (carbon nitride, C3N4), graphene and metal-organic framework (MOF)-based hybrid nanostructured photocatalysts for the water purification and the solar hydrogen production. Such efficient photocatalysts are expected to solve the issues of environmental remediation.